The city, located at 11°33′00″N 104°55′00″E﻿ / ﻿11.55°N 104.91667°E (11°33' North, 104°55' East), covers an area of 678.46 square kilometres (262 sq mi), with some 11,401 hectares (28,172 acres) in the municipality and 26,106 ha (64,509 acres) of roads. The agricultural land in the municipality amounts to 34.685 km2 (13 sq mi) with some 1.476 km2 (365 acres) under irrigation. As of 2008, Phnom Penh had a population of 2,009,264 people, with a total population density of 5,358 inhabitants per square kilometre (13,877/sq mi) in a 678.46 square kilometres (262 sq mi) city area. The population growth rate of the city is 3.92%. The city area has grown fourfold since 1979, and the metro area will continue to expand in order to support the city's growing population and economy. Phnom Penh's population is expected to increase to 3 million at the end of 2016. 2015 Cambodian League is the 31st season of the Cambodian League. Contested by 12 clubs, it operates on a system of promotion and relegation with Cambodia Division 1 League. With 12 teams playing 22 games each totaling 132 games in the season. With the newcomer Abilrex Niigata from Japan. However, Albirex has announced that they won't participate in 2015 Cambodian League due to financial crisis and replaced by CMAC United. Boeung Ket Angkor who finished top of the regular season also qualified for the Mekong Club Championship. The end of the season was mired in match-fixing claims by Phnom Penh Crown who claimed that several players of the club had under performed. They announced these claims with only the two-legged playoff final remaining. 2016 Cambodian League or 2016 Metfone Cambodian League is the 32nd season of the Cambodian League. Contested by 10 clubs, it operates on a system of promotion and relegation with Cambodian Second League. Western Phnom Penh decided to merge with Cambodian Tiger, but later both team couldn't reach an agreement. The league starts from 19 February until 14 August. Phnom Penh Crown are the defending champions. 2017 Cambodian League or 2017 Metfone Cambodian League is the 33rd season of the Cambodian League. Contested by 12 clubs, it operates on a system of promotion and relegation with Cambodian Second League. The league starts from 18 February until 19 November.Boeung Ket Angkor are the defending champions. 2018 Cambodian League is the 34th season of the Cambodian League. Contested by 12 clubs, it operates on a system of promotion and relegation with Cambodian Second League. The league starts from 3rd of March until 30th of September.Boeung Ket are the defending champions. Nagaworld FC won the champion again after waiting since 2009. 2019 Cambodian League is the 35th season of the Cambodian League. Contested by 14 clubs, it operates on a system of promotion and relegation with Cambodian Second League. Daun Penh District or Doun Penh District (Khmer: ខណ្ឌដូនពេញ, "Lady Penh") is a major district in Phnom Penh, Cambodia. Many major businesses in Phnom Penh like Sorya Shopping Center and Mokod Pich Jewelry Enterprise are located here. The district has an area of 7.44 km². According to the 1998 census of Cambodia, it had a population of 131,913.The district is the commercial hub of Phnom Penh, marked by Phsar Thom Thmey with its unique art deco architecture and several major roads which emanate from and pass near the market. The district is subdivided into 11 Sangkats and 134 Kroms. This is a list of tallest skyscrapers and supertalls in Southeast Asia with a height of at least 100m. They are ranked by structural height. This is a list of universities in Cambodia. This is the list of universities in Cambodia according to the Cambodian Ministry of Education, Youth, and Sport. The Cambodian formal education system ceased to exist and many educated people fled the country or died during the Khmer Rouge era (1975–1979). After the fall of the Khmer Rouge, the education system had to be rebuilt from scratch to become what the modern national education system is today, starting from Grade 1 (at age 6) to Grade 12 for a total of 12 years of public general education. Exams are held for any potential students to enter higher education institutions and continue their studies. Notre Dame Cathedral, also known as the Cathedral of Phnom Penh (Khmer: រាជធានីភ្នំពេញវិហារ; French: Cathédrale de Phnom Penh), was a 19th-century French Gothic revival church that served as the cathedral of the Apostolic Vicariate of Phnom Penh. It was located in the Russei Keo District of the city on Monivong Boulevard. The construction of the cathedral began in the 19th century and was overseen by the French colonial government in Cambodia. The architectural style has been described as resembling Reims Cathedral. Shortly after the Khmer Rouge conquered Phnom Penh at the end of the Cambodian Civil War, the cathedral was destroyed. Operation Eagle Pull was the United States military evacuation by air of Phnom Penh, Cambodia, on 12 April 1975. At the beginning of April 1975, Phnom Penh, one of the last remaining strongholds of the Khmer Republic, was surrounded by the Khmer Rouge and totally dependent on aerial resupply through Pochentong Airport. With a Khmer Rouge victory imminent, the US government made contingency plans for the evacuation of US nationals and allied Cambodians by helicopter to ships in the Gulf of Thailand. Operation Eagle Pull took place on the morning of 12 April 1975 and was a tactical success carried out without any loss of life. Five days later the Khmer Republic collapsed and the Khmer Rouge occupied Phnom Penh. Phnom Penh Cable Television, also known as PPCTV, is a cable TV subscription service established by Phnom Penh Municipal Cable Television (PPCTV). It is one of the major cable TV services in Cambodia with the largest number of viewers concentrated in Phnom Penh. Phnom Penh Crown Football Club (Khmer: ក្លឹបបាល់ទាត់ភ្នំពេញក្រោន) is a football club from Phnom Penh, Cambodia. Formerly the team were called Samart United, Hello United, Phnom Penh United and Phnom Penh Empire before establishing their current name, Phnom Penh Crown FC in 2009. The club has won 6 Cambodian League titles. Phnom Penh International Airport (IATA: PNH, ICAO: VDPP) (Khmer: អាកាសយានដ្ឋានអន្តរជាតិភ្នំពេញ French: Aéroport International de Phnom Penh), is the busiest and largest airport in Cambodia containing land area of 400 hectares. 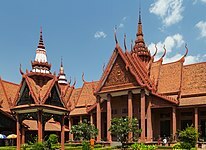 It is located 10 kilometres (5.4 NM) west of Phnom Penh, the nation's capital. Cambodia is divided into 25 provinces (Khmer: ខេត្ត, khaet, singular and plural). 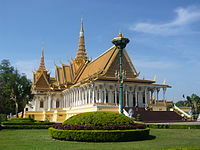 The capital Phnom Penh is not a province but an autonomous municipality and is included as the 25th province since it is administered at the same level as the other 24 provinces. Phnom Penh has both the highest population and the highest population density, but is the second smallest in land area. The largest province by area is Mondulkiri and the smallest is Kep which is also the least populated province. Mondulkiri has the lowest population density despite being the largest province. Each province is administered by a governor, who is appointed by the Ministry of Interior. Cambodia is subdivided into 163 districts (srok, ស្រុក). The 12 districts of Phnom Penh are called khan (ខណ្ឌ), but even in official documents they are sometimes misidentified as srok. The number of districts in each province varies, from two in the smallest provinces to 14 in Battambang, Prey Veng, and Siem Reap. Further subdivision levels are khum (ឃុំ)(subdistricts), sangkat (សង្កាត់)(quarters) and finally, phum (ភូមិ) (villages). In Phnom Penh there are no khum. 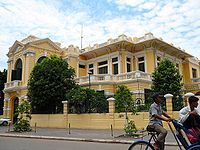 The Royal University of Phnom Penh (RUPP) (Khmer: សាកលវិទ្យាល័យភូមិន្ទភ្នំពេញ, French: Université royale de Phnom Penh) is a national university of Cambodia, located in the capital Phnom Penh. Established in 1960, it is the country's largest university. It hosts more around 20,000 students in undergraduate and postgraduate programs. It offers degrees in fields such as sciences, humanities and social sciences, engineering as well as vocational courses in fields such as information technology, electronics, psychology and tourism. 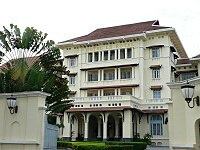 RUPP provides Cambodia’s foremost degree-level language programs through the Institute of Foreign Languages. RUPP has full membership in the ASEAN University Network (AUN). Sen Sok (Khmer: សែនសុខ) is an administrative district of Phnom Penh, Cambodia. As of 2008 it had a population of 147,967. It formerly belonged to Kandal Province. It contains the Sen Sok International University Hospital. The Phnom Penh Post (Khmer: ភ្នំពេញបុស្តិ៍) is a daily English-language newspaper published in Phnom Penh, Cambodia. Founded in 1992 by publisher Michael Hayes and Kathleen O'Keefe, it is Cambodia's oldest English-language newspaper. The paper was initially published fortnightly as a full-color tabloid; in 2008 it increased frequency to daily publication and redesigned the format as a Berliner. The Phnom Penh Post is also available in Khmer language. It previously published a weekend magazine, 7Days, in its Friday edition. Since July 2014, it has published a weekly edition on Saturdays called Post Weekend. Post Weekend was folded into the paper as a Friday supplement in 2017 and was discontinued in 2018. It has a staff of Cambodian and foreign journalists covering national news. The newspaper includes specific business, lifestyle and sports sections, and also prints a "Police Blotter", which has items related to crime translated from local Khmer-language dailies. Since its founding in Phnom Penh in July 1992, the printed edition was formerly published on a fortnightly basis, and read in Cambodia and worldwide by over 20,000 people in more than 40 countries. In early 2008, the newspaper received investment from some Australians and became a daily publication on August 8, 2008. The Post's news and analysis provide regular and thorough coverage of current issues in a rapidly changing Cambodia. Significant events covered range from the implementation of the UN-sponsored 1991 Paris Peace Accords and subsequent elections, to the promulgation of a new constitution enabling the establishment of a constitutional monarchy. In May 2018 the newspaper was purchased by Malaysian businessman Sivakumar Ganapthy, who also owns a public relations firm known to have worked on behalf of the Cambodian government, prompting several senior writers to leave its newsroom. Describing the sale of the paper, one official for Amnesty International said, "We have witnessed the crumbling of Cambodia's media freedom." In response to criticism of the sale, Huy Vannak, acting as undersecretary of the Cambodian Interior Ministry, said, "It is a normal business, and it remains a newspaper."